Menu The product Her story Questions? What makes Cobbler Mom goods so tasty isn't just the love Cobbler Mom puts into the baking, but also ingredients that go into the cobblers. Her crust is flaky and never soggy. Filled with fresh fruit, we guarantee you'll love anything you purchase. A little jar of joy! A young and curious Joyce would watch her mother make succulent apricot turnovers in the kitchen as a child. Intrigued by every step in the process, she would ask questions but would rarely receive answers in return. However Joyce soon realized that the real reason her mother did not teach her how to create certain dishes was because she did not measure ingredients. Determined to adopt the art of baking, Joyce sought guidance from her grandmother; but to no avail she encountered the same issue as before...no measurements. A patient and understanding aunt saw the passion that Joyce had for baking and took the time to teach her a family recipe of crust perfection that would soon be the foundation of a new culinary beginning. Learning not only how to bake, but to cook was also a goal of hers so that when her son was born he would not have to be reliant on fast food. She dreamed of creating his favorite desserts and showing her love in the kitchen, but until he was born, her family and friends would gladly enjoy the baked blessings. How many servings come in each cobbler jar? Each jar comes with a little more than one serving of cobbler. Don't let the small jar size fool you; it will be very satisfying. How long will my cobbler typically last? 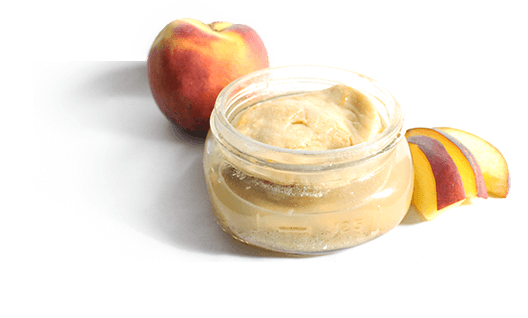 Our jars will extend the average lifespan of a cobbler is one whole week! Freezing your cobblers can extend your shelf life. Are all of the cobblers in jars? No. If you are interested in purchasing full cobblers, please fill out our contact form and we will get back to you shortly with further details. Not yet, but we look forward to serving you delicious cobbler in a store-front one day in the near future. Yes - but because we want to minimize time of our delicious cobbler from our oven to your stomach, we use priority shipping. All cobblers are made-to-order, so please give us 2-3 days to prepare your order for shipment! Is there an order minimum on cobblers? Yes. When ordering from Cobbler Mom you must order a minimum of 4 jars for us to be able to fulfill your order. No. Since we are a very small, locally owned business, our overhead costs are the same no matter how many cobblers we make for you. If you have any special requests or orders, please fill out our contact form below. Do you offer gluten-free cobbler? Sorry - our cobblers are made with so much flavor and goodness, we just can't mess with perfection. What happens if I received a cobbler as a gift, and there’s an issue? We are not liable for any products that are not served or delivered directly from Cobbler Mom. How can I help support Cobbler Mom? We graciously accept any donations that can help our small business grow into a cobbler empire! Other Questions or Special orders? Cobbler Mom supplied all the baked goods for my housewarming. They were so popular we had to limit them to one per household.